Some birders have no time at all for seawatching. But me, I like seawatching. A lot. Like many a south coast birder I'd been watching the forecast, and today's looked quite promising. A strong wind from the SE or thereabouts; mostly cloudy. I struggled to get out of bed though, and wasn't at Burton Bradstock until 06:40. Things were not fast and furious, but a few Gannets were moving through, which always gives me hope. Shortly after 07:00 I picked up a small flock of ducks, or should I say a flock of small ducks? At least, they looked small. Admittedly, the only ducks I'd seen thus far were three Common Scoter, but this lot definitely looked smaller than Scoters. I'd picked them up rather late, and though they weren't far out I only had about 15 or 20 seconds to sort them out. My knee-jerk analysis was 'Garganey'. They were fast and tight, and I couldn't decide whether there were 8 or 9. I could see several pale upperwings, but they were zipping past so rapidly that I couldn't really swear I'd got the drakes' head pattern...and then they were gone. Ooh, I thought, conscious of some biochemical stuff going on, that's a little adrenaline rush there. Cool. My thumb hovered over the 'Tweet' button...and suddenly I had a small crisis of confidence. After all, you've only been watching about 25 minutes, and seen just 3 Scoter, right? Your only ducks so far. Have you got your eye in properly yet? That's right: no, you haven't. And how many times have you seen Garganey on a seawatch exactly? Just three times, ever, yes? Precisely. 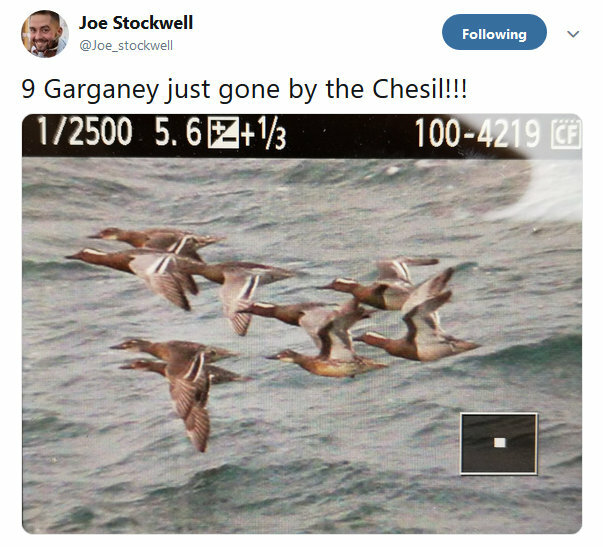 So what are the chances that they truly were Garganey then, eh? You know, probability-wise?? Er, very, very low indeed? And so my draft Tweet was never sent. I have this vivid memory of standing in a phonebox adjacent to Staines Res in June 1983. I have been watching a stonking little Red-necked Phalarope on the drained north basin. A female in full breeding plumage. A proper stunner, and totally unmistakable. And there I am, 10p in hand, hesitating to make the first call. Why? Because this ludicrous thought has wormed its insidious way into my head: why isn't it a Grey Phal in breeding plumage, rather than Red-necked? Are you 100% sure you're not dropping an almighty clanger? This photo genuinely made my day! So there we go, a classic example of a seawatch being made especially memorable by non-seabirds. Beautifully written as ever Gav. And a post about birding! Welcome back. Kind words, Steve. Thank you. I assume you cycled to the seafront?